Over the years I have tackled many staining projects. Some of the projects were for inside applications such as staining doors and trim, while others involved exterior applications such as staining picnic tables and wooden swing sets. All involved the use of a foam application brush, a stain brush and/or a rag. Recently, however, I had a small exterior stain project that I decided to try an alternative type of stain applicator, a spray can. Krylon offers an exterior semi-transparent stain in a convenient spray can that is ideal for small outdoor projects, such as wooden chairs, benches, picnic tables and lattice work. I decided to try it to see how well it worked. To put it simply, I was extremely impressed with both the spray can applicator and the finished results. 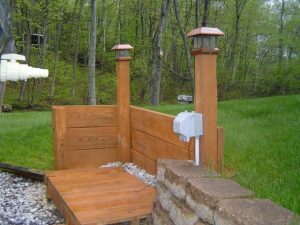 My exterior stain project was a small wooden frame structure that surrounds my pool pump. Before applying the Krylon exterior stain, I cleaned the wood surface area with a deck cleaning agent and let it thoroughly dry. In my particular application there had never been a stain or paint applied to the wood. For projects that have existing stain or paint on them you may want to remove it first prior to applying new stain. If you do decide to sand or scrape off old paint, it is important that you first have the paint tested for lead prior to removing it. Lead is a toxic substance that is harmful to humans. After cleaning the wooden frame structure, I taped off the areas that I did not want to apply stain to. Holding the can approximately 8-10 inches away, I then applied a light application to a small and inconspicuous section of the frame structure to judge the results. Satisfied with the appearance I then applied the stain to the entire wooden frame structure in short, smooth, side to side strokes across the wood surface area. After 15 minutes the stain was dry to the touch and I applied a second coat. Like with any spray can application, to avoid running it is best to apply multiple lights coats versus applying fewer heavy coats. It is also important to note that when planning to apply exterior wood stain that you first read the application instructions on the can, and check the local weather. For Krylon’s exterior stain in a spray can, the temperature should be between 50o and 90o Fahrenheit and the humidity level should be below 85% for proper application. Also, due to the fact that you’re spraying the stain onto the wood surface it is important that there be little to no wind. Finally, with any spray can application, the area should be well ventilated and safety glasses worn. Krylon offers its semi-transparent exterior stain in its convenient spray can, in a half dozen common colors. So the next time you have a small exterior stain project, consider Krylon’s exterior semi-transparent stain. It goes on fast and easy, there is less mess and clean up, and the finished results are impressive.